Generosity is dramatically exemplified by the coming of the Magi to Bethlehem. I’m guessing their arrival on the scene was a surprise to Mary and Joseph, an unscheduled blessing. Nothing announced the Magi’s coming. They read the signs of their times—and the stars in the sky—and took it upon themselves to visit and offer gifts befitting the newborn king. Their lengthy journeys were made at their own expense; their gifts bestowed unexpected provision for Jesus’ family, indicating a larger, eternal plan was in motion. The Magi could never have fathomed that what they gave freely and generously to the Holy Family would ring down through the ages, blessing untold numbers whom they would never see or meet. From my vantage point, that is the by-product of generosity: you just never know where the ripple effect might lead. One gracious word, gift, or action can leave quite a wake. My earliest recollection of the word generosity comes from Girl Scout camp. I remember singing at the top of my lungs a ditty that still echoes in my brain: “She wears a ‘G’ for Generosity!” That little tune spelled out the virtues of being a G.I.R.L. S.C.O.U.T. But I saw it on display in the selfless service of my camp leaders. Generosity was just one of those things implicit in what Mom or Dad asked of me in so many ways without really calling it such: “Share with your sisters” and “try not to be stingy.” Author Lisa Hendey of CatholicMom.com speaks of her own memories, recalling her parents’ advice: “Always err on the side of generosity.” And that’s so true. God’s munificence leads us, like Magi-wannabes, toward charity for others. 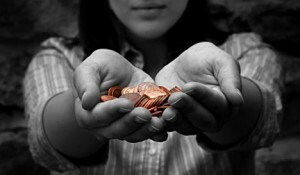 Generosity is the ability to give with no thought of getting, whether one is giving time, talent, or treasure. Fortunately, in God’s economy, giving without thought of a return is never for nothing. People I know have routinely offered their generosity to my family and me. I am so grateful for their unselfish love. Even if they were unable to see into the future to know if it was all going to be worth it, they didn’t stop from giving in the first place. The gifts of the Magi remind me of a remarkable potentiality: when we bestow generosity on those beyond our own circles, unseen exponential blessings become possible. There are many people this side of heaven who will never know that they have participated in the largesse of Providence through their own charitable giving. My own memories are filled with stories of the ripple effects of generosity. Back in my college radio days, I asked the station manager for an opportunity to do a radio show featuring Christian music and commentary. (In the late ’70s there was little-to-nothing of what we call “Catholic radio” today.) The manager offered me a chance to produce a pre-recorded show to air in the traditional Sunday morning slot. The only hitch was that I had to provide the content and the music. Mind you, I was a struggling college student. My meager part-time job’s income was going to my college tuition. I could not finance a radio show without any sponsors. So I prayed and was inspired to talk to a local shopkeeper, the owner of a Christian bookstore. That Christian man listened to my dream of starting a Catholic radio show. To my shock and surprise, after our conversation, I walked out of his store with a stack of music albums under my arm—all for free! That storeowner did not know me, but his generosity set me on a path that would eventually lead me into Christian radio fulltime for several years. The ripple effects from that gift not only blessed me personally, but all my listeners who heard the music and the message of those shows. And it continues to resonate in my work in new media today. We may never know who might be ultimately blessed by our generosity. The ripple effects are often shielded from our sight. But God uses generosity to help convert souls, I’m sure of it. Years ago I met a woman who became a regular at a rosary prayer group I was leading. For a long time, she was tentative about getting to know the others in the group, but she kept coming. The women of the group provided a warm welcome to this busy mother finishing her college degree while raising her family. Finally came graduation, and to her surprise and delight, all the women from the prayer group had generously pitched in for some gifts that recognized her accomplishments. That singular day of generosity had ripple effects that we did not know about until much later. Over time, this woman experienced a true reversion to her Catholic faith. Eventually her marriage was blessed in the church, and her husband converted to Catholicism too. Years later, she revealed that as she was sizing things up and deciding to come back to the church, she was simultaneously meeting regularly with Jehovah’s Witnesses who visited her home. I asked her why she chose to return to the Catholic Church in the end. Her answer was no surprise: it was the generosity of the Catholic families who had reached out to her; charity was a hallmark of their faith. She said that in all her discussions with the Jehovah’s Witnesses, never once was she invited to their homes or tables. Generosity’s ripples had won her over. And it didn’t stop there—those ripples reached her husband and children and the people she meets today. The work of generosity is never limited to an isolated situation. Like a seed planted in the ground, generosity has a growth that is guided by God. Each time we lavish someone with something good, true, or beautiful, there’s no telling how far the blessings might reach. Just the other day I got an email from a long-distance pal. She told me that her aunt gave her a generous financial gift that will enable her to do some traveling. This friend is soon scheduled to come my way. Now this aunt’s intention was to bless her niece. And indeed she has. But the ripple effects of auntie’s gift will reach out and bless me, too, as I enjoy a long-anticipated visit with my friend. The Magi remind us that life is too short not to live as generously as our hearts and means allow. And to be ever grateful for the unexpected appearance of Magi in our time, who visit their gifts upon us, and whose love overflows into unseen rippling wakes that they leave behind. The point is this: he who sows sparingly will also reap sparingly, and he who sows bountifully will also reap bountifully. Each one must do as he has made up his mind, not reluctantly or under compulsion, for God loves a cheerful giver. And God is able to provide you with every blessing in abundance, so that you may always have enough of everything and may provide in abundance for every good work. He who supplies seed to the sower and bread for food will supply and multiply your resources and increase the harvest of your righteousness. This article originally appeared on Patheos.com and is used with the author’s permission. Next Article AUL’s Life List: Where Does Your State Rank?